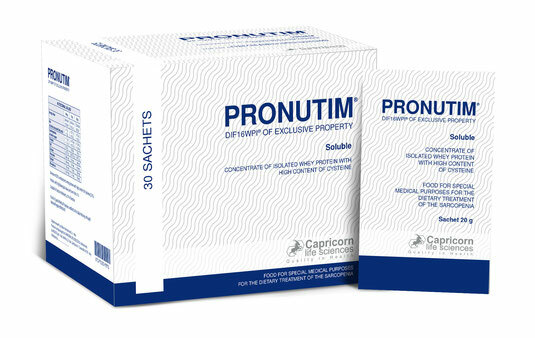 PRONIUTIM SOD - De website van capricornlifesciences! PRONUTIM SOD contains exclusive Whey Protein Isolate produced by microfiltration and spray drying process, with the addition of microencapsulated vegetable superoxide dismutase (SOD), which provides additional contribution to a protein diet. The SOD microencapsulation provides an enteric-coating protection able to inhibit SOD degradation during the digestive process. Being effectively protected, it passes through the stomach and entirely reaches the intestinal lumen where its biological activity begins. * acute and chronic infections and chronic inflammations, like autoimmune rheumatic diseases (systemic lupus erythematosus, rheumatoid arthritis, scleroderma, immune-mediated vasculitis). * chronic neurodegenerative diseases, such as amyotrophic lateral sclerosis (ALS), particularly in its hereditary form where the mutation of the SOD1 antioxidant system is present.